One major concern voiced by sustainability experts involves the promotion of constant economic growth by conventional economists. Beginning with fossil-fuel discoveries in the late 18th century, the world has been on an increasing consumption binge propelled by a dubious economic paradigm: All Economic Growth is Good. This endemic socio-political, religious-like belief holds that true prosperity can only be achieved by increasing the economic growth rate, the higher the better. In other words, without economic growth, society can expect austere living conditions. Maintaining constant economic growth depends on increasing the number of consumers, which requires consumption of more natural resources. 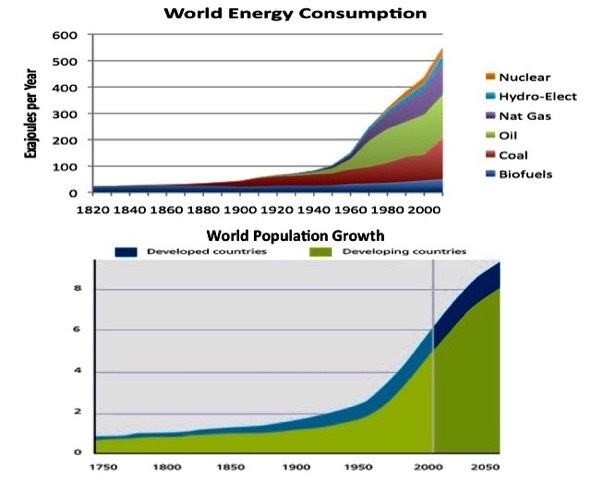 In charts illustrating growth rates of various phenomena, the exponential factor (accelerated growth) appears as a hockey-stick form, as illustrated in the two charts above, showing the exponential correlation between energy consumption (plus all natural resources) and population growth. Unfortunately, most people either don’t know about exponential growth, or they fail to understand how it functions. The population chart shows growth commencing in 1750 up to 2000, with estimated projections up to 2050, while the energy chart begins in 1820 and goes to around 2010. More recent charts show fossil-energy levels peaking around 2015 and slowly falling over time, with renewable energy picking up the slack somewhat. There are projected future needs for energy that apparently cannot be determined at this time. But most experts agree that increasing population growth will add extreme demands for energy, demands that will pose severe challenges for ongoing economic growth. Most sustainability experts agree that population growth and consumption are in overshoot mode. Global Footprint Network estimates that approximately every eight months, we demand more renewable resources and C02 sequestration than the planet can provide for an entire year. This year, Earth Overshoot Day landed on , indicating the date when humanity exhausted nature’s budget for the year. And it grows worse every year! As I’ve mentioned in previous commentaries, there are essential forms of growth, including material growth that provides basic life needs, including developing healthier soil through composting. But the most advanced—perhaps even unlimited—types of positive growth are non-material in nature, including all of humanity’s acknowledged moral-based values and practices adopted over thousands of years of evolution. Like rampant cancers that ravage their living hosts, we humans are destroying our primary source of life-giving substances: our planet home! What’s more, like multiplying rabbits, our numbers are increasing, which suggests we will continue devouring the basic materials needed for sustaining life. Overpopulation is a genuine threat, but it happens that there are humane solutions—if only people will recognize the problem and get busy addressing this vital issue. Assuming the readers of this newsletter understand and believe this is to be true, what can be done to get the message out? I offer one simple action. Within our individual spheres of influence, we can share educational materials that provide information and inspiration, which can stimulate cogitation. Several helpful sources are listed in the Sustainability Events/Info sections. But I have a suggestion for an event that’s available via streaming very soon, on Wednesday, Dec. 14, at (CTS). Dave Gardner, founder of GrowthBusters and filmmaker, is also director of World Population Balance in Minneapolis. His free webinar—“End Overpopulation Or Stop Overconsumption?” features Stanford Biologist Paul Ehrlich (author of The Population Bomb), former UK Guardian columnist Madeleine Somerville (author of All You Need Is Less: A Guilt-Free Guide to Eco-Friendly Green Living and Stress-Free Simplicity), and Dave Gardner, interviewer. Go to this link to register and hear this one-hour discussion: https://www.growthbusters.org/solving-overshoot-webinar/. I hope you’ll join me online soon for what promises to be a very worthwhile event. If you can’t tune in, check back later on the website for a recorded session. For a warm-up study, I suggest you read the following article by Erik Linberg: “Growthism”. > Resilience: Growthism (Erik Linberg). This need to grow—Growthism—is the foundation of our current condition and the key concept of our present worldview. It has become a sort of theology and advanced democracies are equally theocracies of Growthism. It is our official ideology, but not in the common partisan sense of the word. Rather, it describes a value or a good that is mainly invisible and obediently accepted without question. Growth, and growth without end or limits, seems like the natural and inevitable order of things. None of this is true. Growth of the sort we celebrate is only a few hundred years old, and the creed of Growthism is far younger than that. Growthism began as a new condition of reality, and became a solution so successful that it became inexorably embedded in our systems, directing and controlling them, appearing as an inescapable natural law; and then, just when it looked like we may have reached the limits of growth, Growthism became an earnest, though idolatrous belief. > Resilience: The Great Deceleration (Alex Jensen). The relentless expansion of global economic activity is the heart of the multiple interlocking crises that beset societies and the earth today, and is inimical to life, to the world, even to genuine wellbeing. No matter how polluting, how much land and water are required, how many communities will be displaced and livelihoods destroyed, the formula is basically the same: more mines, more coal and power plants, more tourism, more of everything. So the increasing scale and speed of the economy is, for the vast majority, the enemy of prosperity. If we wish to instead honor, defend, and respect life and the world, we must upend that logic, and begin the urgent task of downscaling economic activity and the system that drives it. We must embark upon the ‘Great Deceleration’. Given that the economy today is vastly exceeding what the planet and its denizens can give and take, degrowth promotes not merely slowing and stopping growth, but reversing it. > Washington Post: Under Trump, Red States Are Finally Going To Be Able To Turn Themselves Into Poor, Unhealthy Paradises (Steven Pearistein). Data compiled by the Pew Charitable Trust found that 10 states treceive less than a dollar back for every dollar they send to Washington: Delaware, Minnesota, Nebraska, New Jersey, Connecticut, Illinois, Ohio, Massachusetts, New York and Rhode Island. And here are the states that get more than $2 back for every $1 in taxes paid: Mississippi, New Mexico, West Virginia, Hawaii, South Carolina, Alabama, Maine, Montana, Alaska, Virginia, Arizona, Idaho, Kentucky and Vermont. Red state voters may talk a good game about small government and low taxes, but in reality they are socialist moochers. Tax cuts—especially on investment income—will benefit the residents of Democratic states where incomes, and thus income taxes, are significantly higher. Governors and legislatures in those states—home to roughly half of all Americans—will now have the financial headroom to raise state income and business taxes by as much as the federal government cuts them—and use the additional revenue to replace all the cuts in federal services and benefits. > Resilience: Whole Systems, Humility, And Empathy—Thoughts About A Sustainable And Resilient Politics (Erik Lindberg). If we were to consider the recent election and its aftermath as a dry run or a sort of stress test for the way the more liberal half of America will respond to the emerging climate crisis, the outlook is mixed, at best. I have been troubled by the large number of liberals who, as a response to Trump, have adopted a pose resembling a sort of mirror image—not in content, but certainly in format—to some of Trump’s supporters. Because we will need political resiliency in the future, this unhinging of the center-left does not bode well for the future for the rarely acknowledged fact that the climate crisis will not appear as a climate crisis, at least not to most people in the U.S. Rather, it will appear as a political crisis, often precipitated by economic upheaval. My hope is that more people will use this moment to realize our political system has become dysfunctional, and rise above it. > Post Carbon Institute: Localism In The Age Of Trump (Richard Heinberg). Throughout the last couple of decades, liberal globalists argued that climate change could only be fought with international treaties. By becoming global citizens, we could overcome ancient prejudices and fulfill humanity’s evolutionary destiny. Localists responded that, in practice, economic globalization has nothing to do with moral elevation or with worker and environmental protections, but everything to do with maximizing short-term profit for the few at the expense of long-term sustainability for people and the planet. The American electorate has for now sided with the anti-globalist argument, and we face the imminent presidency of Donald Trump, a corporatist huckster who intends to lead his merry band of cronies and sycophants in looting what’s left of America’s natural and cultural resources. There may be few incentives to tempt localists to work with a Trump administration, so another strategic response would be to block him from doing bad things, through resistance and non-compliance at the local level. Protection of vulnerable places deserves special attention. Localism requires trust, patience, and hard work. > Counter Currents: The Climate Crisis And Economic Policy Choices (Brian Davey). An entirely different way of thinking about climate issues is needed, one that is consistent with the limits-to-growth paradigm. The alternative way of framing the climate debate is to realize that humanity is faced with the high likelihood of a catastrophic ecological tipping point, with many unknowns that impose the need for an absolute limit on what [C02, methane, etc.] can be emitted and captured safely. The limits to economic growth require that climate policy be part of a more general transition of society and economy for which efforts must be made to involve everyone. Techno-innovation may have a role in the transition but will not be the sole or even the main method of reducing energy consumption, as moral, cultural, behavioral and other changes are also needed. Limits need to be imposed as equitably as possible as part of the larger transition, and we need to get on with this task now, as a matter of urgency. > Grist: The Dirty Deplorables: Who’s Who On Trump’s Team (Staff). What do Donald Trump’s cabinet nominees and advisors think about climate change and other sustainability issues? As you would expect, it’s not looking good so far for those of us concerned about a habitable climate and livable cities. Trump is putting together a climate-denying cabal of extreme right-wingers likely to roll back environmental protections, halt smart-growth efforts, and undo progress toward environmental justice. We’ll keep tabs on the most relevant nominees and appointees here, continuing as they make their way through the confirmation process, including: Scott Pruitt, EPA Administrator; Jeff Sessions, Attorney General; Elaine Chao, Sec. of Transportation; Tom Price, Sec. of Health and Human Services; James Mattis, Sec. of Defense; Nikki Haley, U.N. Ambassador; Reince Priebus, Chief of Staff; and Steven Bannon, Chief Strategist. > University of Minnesota-TC: Losses Of Soil Carbon Under Climate Warming Might Equal US Carbon Emissions (Research team). A new study published in the journal Nature, based on 49 climate-change experiments worldwide, including six in Minnesota, suggests that climate warming will drive the loss of at least 55 trillion kilograms of carbon from the soil by mid-century, adding an additional 17 percent on top of the projected emissions due to human-related activ2ities during that period. That would be roughly the equivalent of adding to the planet another industrialized country the size of the United States and thus have a big impact by accelerating climate change. Soil carbon losses will be greatest in the world’s colder places, at high latitudes, which had largely been missing from most previous research. In those regions, massive stocks of carbon have built up over thousands of years and slow microbial activity has kept them relatively secure. > Think Progress: Pipeline Spills In North Dakota Cost $40 Million In Property Damage (Natasha Geiling). The day after the Army Corps of Engineers announced it would not be granting a necessary permit for the Dakota Access pipeline, North Dakota’s State Health Department spill investigation team was dispatched to the western part of the state — about 200 miles from the protest camps at Standing Rock — to contain a crude oil spill from a different pipeline. The spill, which was detected , has sent an unknown volume of crude oil into the Ash Coulee Creek. The pipeline is operated by Belle Fourche Pipeline Co., which has reported 10 spills since 2010, totaling 4,848 barrels of oil and costing $2.26 million in property damage. Belle Fourche’s parent company, True Companies of Wyoming, also has a history of major pipeline spills: In 2015, a pipeline operated by Bridger Pipeline, which is owned by True Companies, spilled around 1,200 barrels of oil into the Yellowstone River in eastern Montana. > Vox: Watch Humans Go From A Tiny Group In Africa To 7 Billion Around The World (German Lopez). A video, from the American Museum of Natural History, shows essentially all of human history in just six minutes. It shows humanity spreading across the world over a few hundred thousand years—even as our population remained under 1 million. After that came the rise and fall of many empires and civilizations, plagues, wars, and so on—all the way to our current population of around 7 billion. Around , in the 18th century, the world population begins to explode thanks to the Industrial Revolution and modern medicine. From 1800 to 2015, the global population grew from about 1 billion to nearly 7 billion. And the population is projected to peak at about 11 billion around 2100. From there it is predicted to begin declining. > Ensia: Burundi Leads The World In Renewable Energy Use — And Other Fascinating Facts About The World Today (Kristen Satre Meyer). Good news: more people across the globe have improved access to safe water and sanitation. Bad news: air quality is a growing problem in lower-income countries. The Population Reference Bureau’s 2016 World Population Data Sheet, released in August, offers valuable insights into not only current and projected demographic measures, but also health, energy and environment trends around the world. Significant to managing health and environmental concerns, the report projects that the combined population of the world’s least developed countries will double by 2050 to 1.9 billion. But these people are on the move, and migration could have an unpredictable impact on regional population estimates and resource management. Air quality is becoming a more pressing issue as global population increases, particularly in less developed regions. > Yes! Magazine: The Real Standing Rock Victory Is This: “Inevitable” Is Not What It Used To Be (Mark Trahant). The Standing Rock Sioux Tribe has defied history. Nearly two years ago, the Dakota Access pipeline and the U.S. Army Corps of Engineers told the tribe about an inevitable pipeline that would cross near their reservation and within treaty lands. The tribe objected, but it was inevitable, a done deal. But “inevitable” blew up on Dec.4th On the same weekend when thousands of veterans showed up to support Standing Rock, the U.S. Army Corps of Engineers announced it will not grant the easement to go under Lake Oahe. Additionally, the Army Corps will now require an Environmental Impact Statement. But there are three critical things to consider in that chronology and the idea of what is “inevitable”: 1) no energy company can roll over a community that’s united; 2) president-elect Trump can revisit the issue, but it will not easily be undone; and 3) this is a moment when North Dakota can tell the world what it really wants to be, a new beginning. > Transition Network: Film Review: ‘Qu’est-Ce Qu’on Attend?’ (‘What Are We Waiting For?) (Rob Hopkins). Marie-Monique Robin’s wonderful new film [documentary] is about Transition in the village of Ungersheim in Alsace, France, The town serves as a laboratory, and the initial results from the experimentation are very encouraging. Transition, since it arrived in Ungersheim, has created over 100 jobs and led to cuts in CO2 emissions of around 600 tons. But it has also done something much deeper. It has changed what people feel is possible, has changed their sense of connection with each other. Ungersheim is a powerful tale because it is one of renewal. ‘Qu’est-ce qu’on attend?‘ is absolutely a story for now, one that challenges myths: that there is no point getting involved in politics because you can’t change anything; that there is no point engaging with your local government; and that stories dividing us are somehow more resonant than those that bring us closer together. ; and 4) Grow more food with fewer resources. > Shareable: Aging In Community: Inside The Senior Cohousing Movement (Cat Johnson). For seniors who want to age in a supportive community environment, cohousing is an exciting alternative to traditional options such as retirement homes and assisted living centers. In senior cohousing spaces, rather than relying on administrators, people rely on each other to lend a hand when needed and provide much-needed social engagement. Anne P. Glass, professor and gerontology program coordinator at the University of North Carolina, Wilmington, has researched the topic of senior cohousing for the past decade. She shares her thoughts about why the senior cohousing model is so appealing, what senior social networks look like in practice, and why we need to get rid of ageist stereotypes. > Resilience: The Rise Of Community Energy (Rob Hopkins). Around the world, the idea that communities install, own, and enjoy some of the benefits of renewable energy is growing fast. In Germany over 50% of renewable energy being installed is in community ownership. In the UK alone, over 5,000 community groups have set up community energy schemes since 2008. Many of these have been Transition groups, and the schemes they have come up with have varied widely in terms of size. This surge in community energy projects offers the potential for greater democratic control, for shared benefits and for greater active participation of the community, which can, in turn, lead to infrastructure and cultural change. Decarbonizing our energy system requires decentralized renewables, which leads us to far greater opportunities for community investment and involvement. And it brings people together, and creates opportunities for conversation, for parties, for relationships. > Cassandra Legacy: Climate Change Communication: Trust Begets Trust (Ugo Bardi). Recently, the University of Florence sponsored a successful, well-received information day on climate change for all employees. It was an eye-opening experience that made me re-evaluate everything I knew about scientific communication. It made me understand how remote climate science is for the people who really suffer from an information deficit problem. Most people who are not scientists get their information from the mainstream media (MSM) and there are two problems with that: one is that they only get snippets and glimpses, drowned in the general noise of the news. The other, perhaps more important, is that they correctly mistrust the MSM. And here lies the problem: we have squandered so much of the trust that the public had in its sources of information that we live squarely in an “Empire of Lies“. Restoring public trust will be very difficult, but widely replicating the U of Florence model could help. > Resilience: When Memes Fail Us (Douglas Rushkoff). A paralyzed, incompetent federal administration will simply require people to develop more local mechanisms for economic recovery, social cohesion, and mutual aid. This means red and blue people working together to maintain the basics of civil society, from food supply chains and healthcare to education and peaceful streets. With neoliberalism and supra-national corporations at bay for a moment, we may actually have more of an opportunity to develop bottom-up alternatives than we’ve had for a long time. The Depression spawned local currencies, farm cooperatives, and new mechanisms for distributed prosperity. Those of us with a foot in the real world stand a chance of building similar tools and networks, today. > Yes! Magazine: No “Victories,” No “Defeats”: Watch Your Words If You Value Social Change (Arun Gupta). In a statement labeled the easement denial a “momentous victory,” native defenders of the Dakota Access Pipeline, who call themselves “water protectors”, also put it into perspective as: “one battle in the larger movement against injustice from the oil-based energy sector.” The nuance is something we can learn from. Navigating the Trump years will require a different mindset, as the federal government begins to focus on rolling back progressive policies. That includes dispensing with words like “victory” and “win,” “defeat” and “loss.” Instead, our language needs to reflect the reality of politics and history as a story of continual struggle. Terms like “gains” and “setbacks” are historically more accurate because there is never an unambiguous final victory. > National Geographic: Documentary ‘Before the Flood’ (Hulu). Watch this powerful new movie streaming; narrated by actor-environmentalist Leonardo DiCaprio.